NIA24 has been available in the UK, exclusively at SpaceNK for a couple of years but having recently gained a new PR representative, has caught my attention again. According to the press release, it's the USA's number one recommended physician skincare line. Based around the key ingredient of Niacin (a.k.a. Vitamin B3), the products are designed to help protect against sun damage and the ageing process. The patented Niacin molecule, Pro-Niacin, has been shown to be so successful in counteracting sun damage that it's been recommended by the National Cancer Institute- strong praise indeed! There are seven products in the line-up, including a cleanser, scrub and eyecare, and I was sent a sample of NIA24 100% Mineral Sunscreen, of which Michelle Williams and Rachel Bilson are fans. I like physical sunscreens, as there's no waiting around before heading out in the sun plus they're better for sensitive skin although some can leave a ghostly white residue on the skin, a major downside. I liked that NIA24 100% Mineral Sunscreen was barely visible on the skin, however it is a thick cream which I found felt rather heavy. It's oil free but I feel that many would still find this uncomfortable. It has a unisex scent so it's good for sharing if travelling, for example. I also like that the cream combines anti-ageing ingredients, however, not having used it on a daily basis, it's difficult to comment on the overall effects. 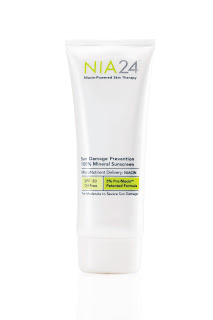 I'm not convinced at how powerful the sun protection actually is and despite really wanting to fall in love with NIA24 100% Mineral Sunscreen, I can't help feeling that it's a bit... meh. Having said this, many people absolutely rave about the range. At £37 for 75ml, it doesn't come cheap but if you do want to try it, there is justification as I firmly believe that skincare (and I'm including suncare here) is one beauty area where you should spend as much as you can afford to.